Floral Gold Accent Wood Jewelry Set in Carnation from Mexico, "Fantasy Flowers in Carnation"
Featuring hand-painted carnation floral motifs over bodies of magenta, three hearts are featured in this jewelry set by Creative Hands of Oaxaca. Promoting teamwork and unity, the Mexican artisans craft two dangle earrings and a pendant necklace from copal wood. Each earring swings from a hook of 14k gold plated stainless steel, and the necklace circles the wearer with adjustable leather cord. Gold plated beads accentuate the necklace. 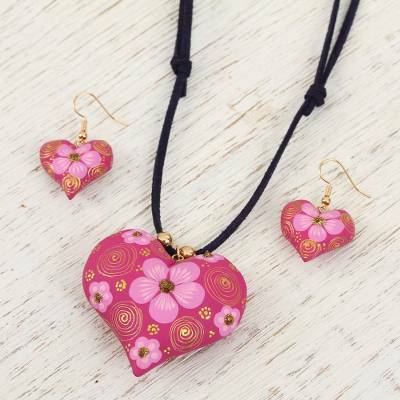 You can find gold accent wood jewelry set 'Fantasy Flowers in Carnation' by Creative Hands of Oaxaca in jewelry categories such as Heart Shaped Jewelry Sets, No Stone Jewelry Sets, Gold Accent Jewelry Sets and Pendant Jewelry Sets. Enjoy exploring these sections for other Novica treasures. "Most of the members of Creative Hands of Oaxaca have learned our art from our parents. This is the legacy they have given us." "The Creative Hands of Oaxaca artisan group is formed by people from different regions of this beautiful part of Mexico. "We work in a variety of media such as tin repoussé, handwoven and embroidered textiles, and jewelry. We also work in metal. We put our hearts and souls into each and every design as well as our Oaxacan identity. At the same time, we are generating employment opportunities in our communities. "The object of this collective is to work as a team. We support one another and share our skills and knowledge. This helps us grow as artists and as people while we create a sense of preserving the culture of our country. "Everything we've done to create this wonderful group has been a challenge, which hasn't let us learn from every single person in the group. "One of these challenges has been the many different languages spoken by members, although we share a common vision that benefits us all. "Most of the members of Creative Hands of Oaxaca have learned our art from our parents. This is the legacy they have given us. It's our duty to help support the household after school and we do this through the traditions of our people. "For all of us, our constant and disciplined work has helped us master our crafts, and we know we can't give up. We must be faithful to what we love. "We have many different sources of inspiration. Each of us feels a different emotion at the moment we create a design. But almost all of us agree that it's our homeland that gives us the lucidity to create new works of art. "Our common goal is to consolidate our work and share this passion with those who let us. "We are grateful to Novica for this opportunity to show our art in other latitudes."